As New York City’s supertall boom spreads beyond Manhattan, the first site in the outer boroughs that should yield a tower exceeding the 1,000-foot mark will be 9 DeKalb Avenue, in Downtown Brooklyn. YIMBY has reported extensively on the evolution of the project, beginning with the initial DOB applications back in June of 2014, and continuing through the full reveal at the LPC last April. Now, machinery is on-site, and excavation work appears to be getting underway for the 1,066-foot-tall tower. 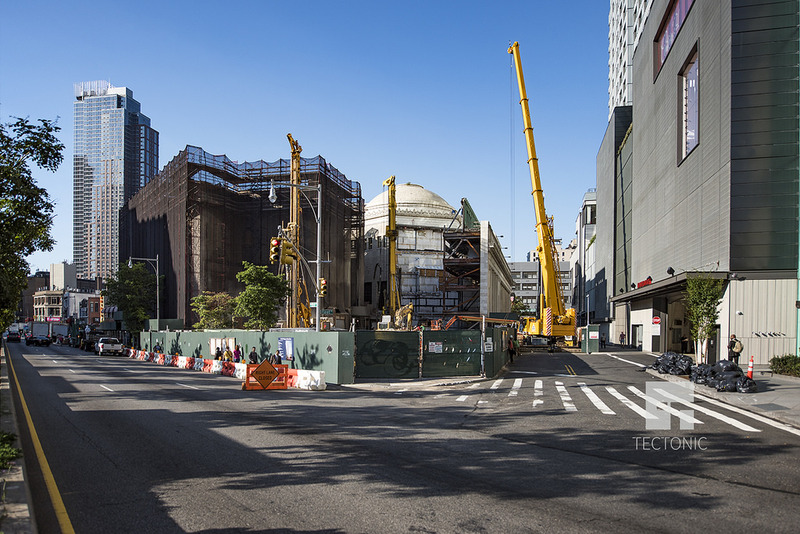 The latest photos come from Tectonic, and show that the portion of the site that will yield the actual supertall is now free and clear of its former structures, and that caisson work has also begun. 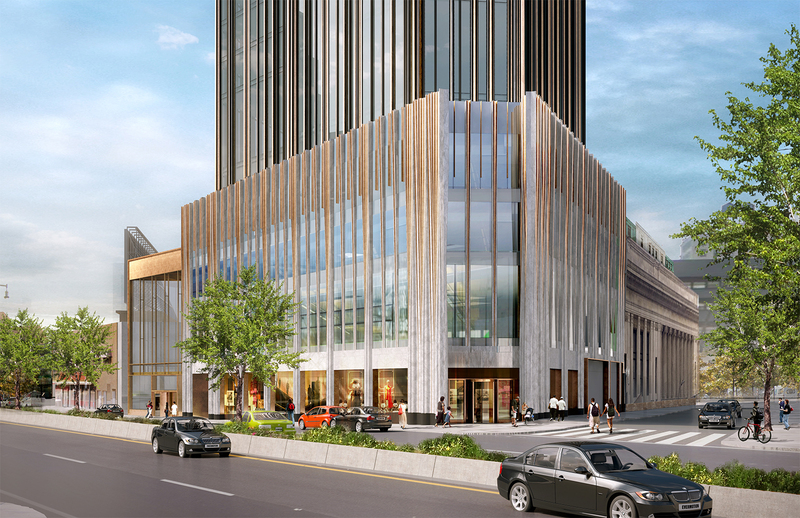 The site is somewhat complicated, with the former Dime Savings Bank Building set to be preserved and integrated into the base of the new tower, comprising almost 100,000 square feet of retail space. Above the retail, the SHoP Architects-designed project will hold about 500 rental apartments, proving that supertalls aren’t the sole domain of the super-rich. While the uppermost units will certainly command premium prices, competition in the surrounding blocks and the sheer number of units within this development alone should translate into relative affordability, especially when compared with the tallest towers rising across the East River. Completion of 9 DeKalb Avenue, which was originally dubbed 340 Flatbush Avenue Ext., was initially anticipated for Q1 of 2019. Now, a 2020/2021 estimate would be much more reasonable, and concrete pouring for the supertall should begin within the next few months. JDS Development and the Chetrit Group are the developers, and they secured a $135 million bridge/pre-development loan for the site back in February. 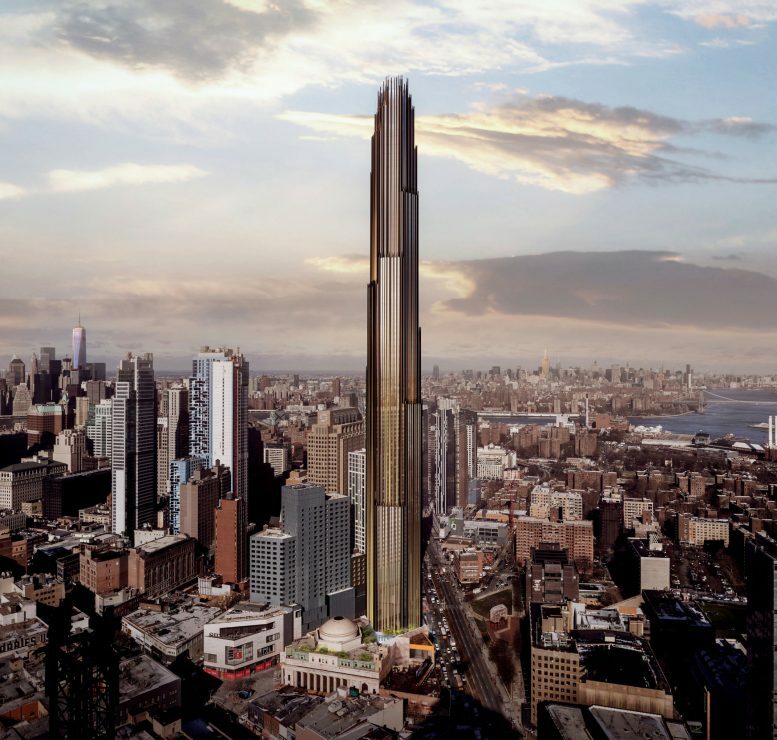 8 Comments on "9 DeKalb Avenue Gets Ready to Rise in Downtown Brooklyn"
across the… Hudson? Jersey isn’t that expensive. I’m excited for this as it may make taller towers more common in downtown brooklyn. Downtown brooklyn has a lot of space where large mixed-use towers can fill in the gaps between buildings. Hopefully the area nearby the bridges and the bqe gets redesigned to be more pedestrian friendly. Affordability? Hah who actually thinks this will be affordable? I moved to downtown Brooklyn this Feb in one of these new towers and now my only regret is that I can’t afford to own here! Please bring it on an keep the rent not super high for another couple of years! Can all these new residents fit onto the subway lines? This one building could lower water pressure all over downtown Brooklyn and beyond.